Revo – A Professional, Clean and Super Fast Responsive BigCommerce Theme. The BigCommerce Theme – Revo is built with powerful Stencil Framework and latest BigCommerce technology that allow you quickly & easily customize your online store. 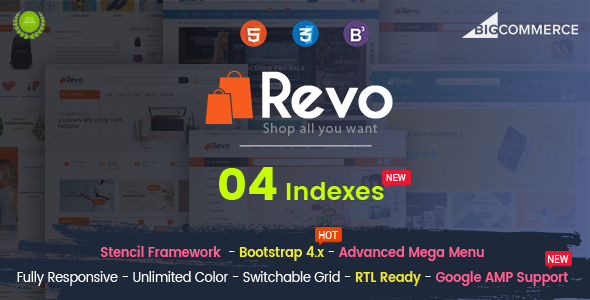 Specially, Revo is the perfect & beautiful combination of minimal layout and trending features: Bootstrap 4.x, Advanced MegaMenu, Unlimited Color Options, Sticky Navigation, Product Badges, Photoswipe & zoom and many more. + UPDATE: Create option (new) show QR code & application on footer. + UPDATE: Create option (new) show subcategories columns on category. + Fixbug: The brand does not show on the product page when you select color and size. + UPDATE: Support Google AMP ( Accelerated Mobile Pages) for BigCommerce Stencil.